If you go to upscale Korean restaurants you will often see this braised Korean beef as a side dish along with the other 500(?) on your table. It is meant to be served as side dish, usually chilled or at room temperature, but can be served as simple meal with some rice. So tender and slightly sweet, this is the one side dish that will be gone as soon as it hits the table. You can ask for more, but just letting you know, they will give you THE look that you don’t wan to see. 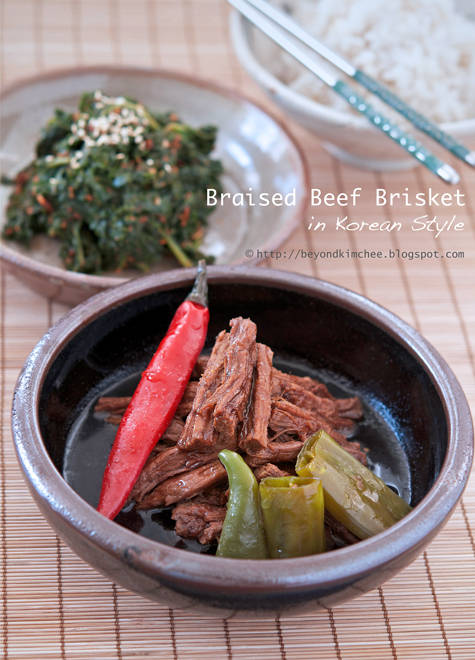 The dish is called “Jangjorim (장조림)”, typically made with beef brisket or beef eye round. Some makes with pork but I like beef better. It is glorious “banchan (side dish)” on any table. You can make a batch and store in a air tight container in the fridge for as long as a month. When you are in a rush or too tired to cook, you will be glad that you have this cow soaked in delicious sauce waiting for you. 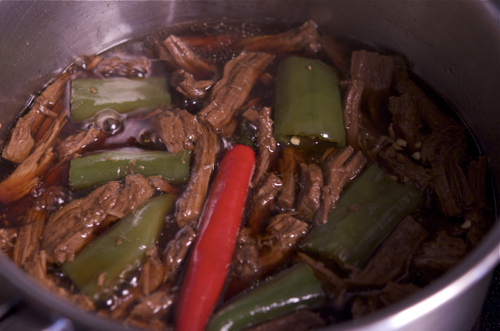 Beef, leek, ginger, peppercorn, bay leaves, Korean soy sauce, soy sauce, rice wine, and sugar. I used beef eye round this time. Brisket is another wonderful choice. 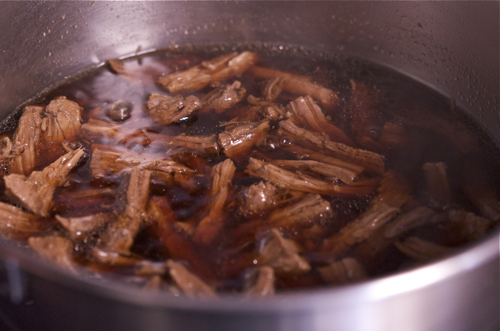 Boil the beef in plain water for 5 minutes. Drain and discard the water. Why? This step will get rid of the yucky scums and some fat from the meat. Now, let’s start with clean pot again. Pour about 5 cup of clean (I mean real clean…) water and add the flavor crews. Boil and simmer for 30 minutes, covered. 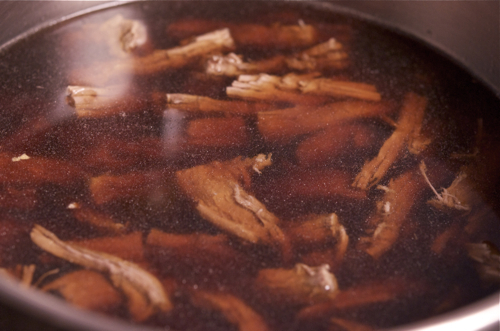 Strain and reserve 2 1/2 cup of stock. Discard the veggies. But keep the main actor, the beef! 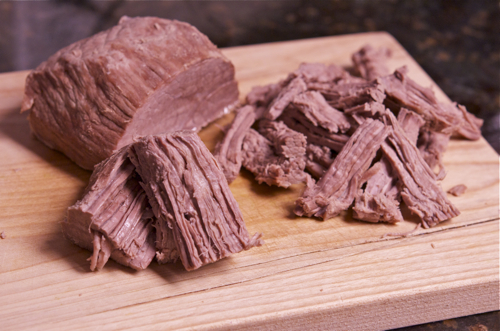 Cool down the beef a little and shred them into bite sizes. 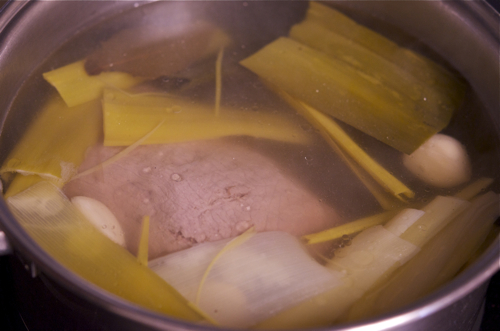 Now, put the beef back into the pot and add the reserved stock. 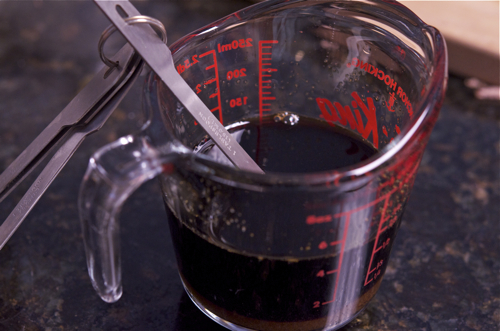 Mix soy sauces, sugar, and rice wine. 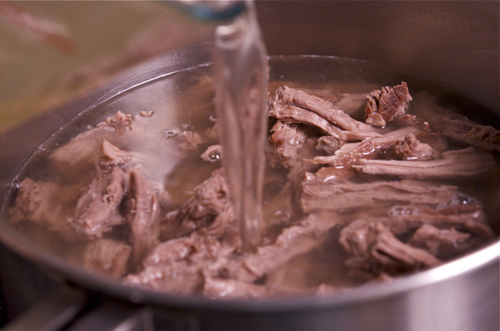 Add into the pot to mingle with beef. the liquid reduces this much. Throw some chili peppers if you like the gentle kick in the flavor. 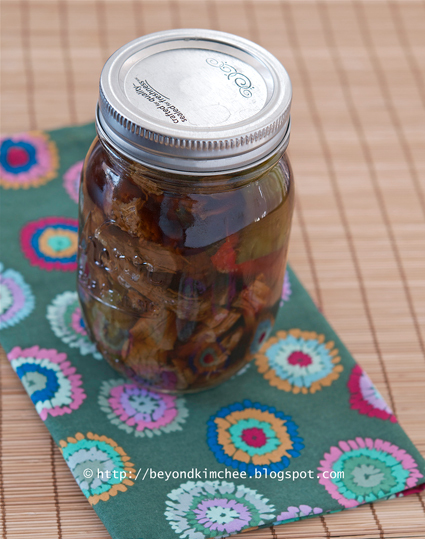 The overall flavor (even with chilies) is mild enough that even my kiddos can handle. Continue to reduce the liquid, COVERED this time, about 5-10 minutes. Cool them down first and store in the airtight container. You can keep them in the fridge as long as you want, but I promise you that it won’t last that long. It only lasted 2 days in my house until every single drop of juice went into our stomach. Note: You will see some particles of fat floating on top after chilled. If that bothers you, simply microwave for 10 seconds. In a medium sauce pan boil beef in water for 5 minute. 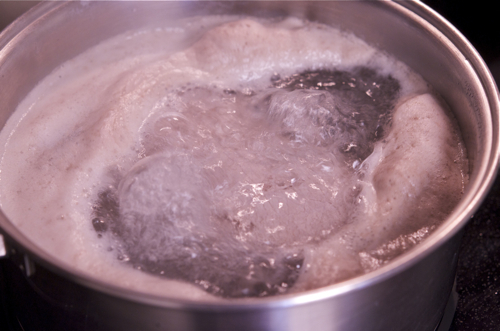 You will see lots of scums floating in the pan while boiling. Take the meat out and discard the water. 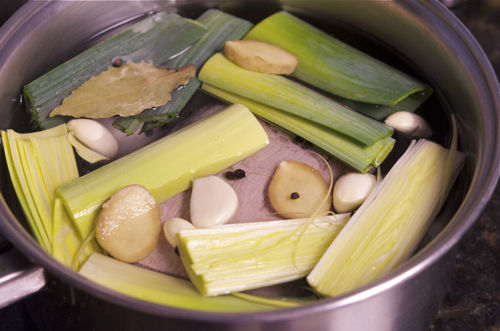 Place the partially cooked meat in the clean sauce pan again and add 5 cups water, leek, bay leaves, peppercorn, garlic, and ginger. Let it boil and simmer, covered, for 30 minutes. Remove the meat from the pan and set aside to cool down a bit. 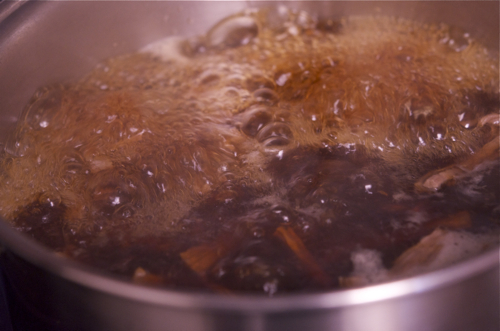 Strain the stock through a mesh and reserve 2 1/2 cup. Shred the beef into bite size. Place them back in the pan and pour the reserved 2 1/2 cup stock. Add the soy sauces, sugar and rice wine, mix well. 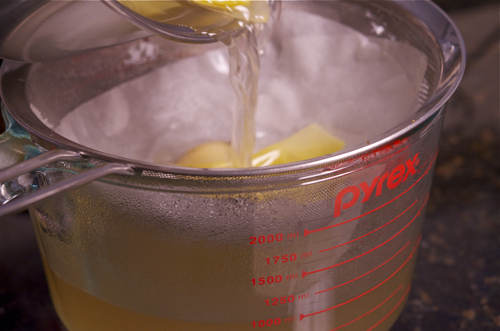 Bring the pan to boil over medium heat and reduce the heat to medium low. Continue to cook down the liquid, uncovered, for about 20 minutes. 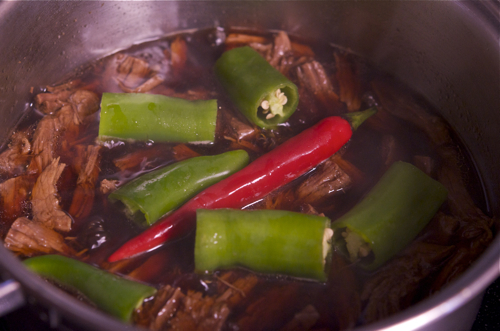 When the liquid is reduced about to the level of beef, add chilies and cover the lid. Continue to simmer for 5 minutes. Remove from heat and cool completely. 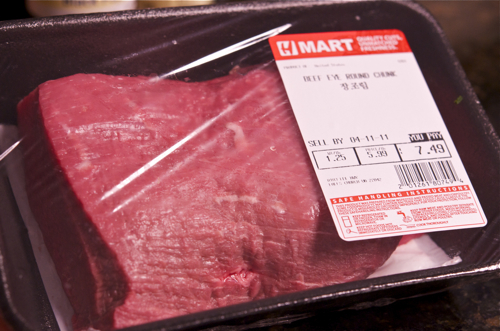 The beef should be kept in an airtight container and can be stored in the fridge up to a month. Note: Once chilled you will see a little bit of fat particles floating on top. If that bothers you, microwave for 10 seconds and you will get a clear juice again. Thanks for the recipe. 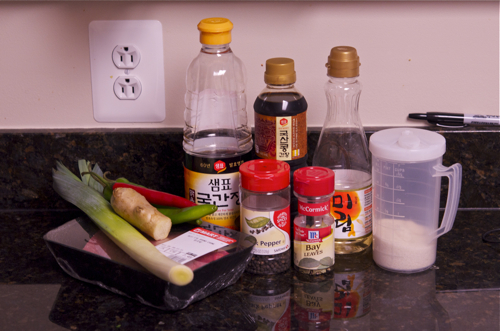 What ratio do you recommend for Korean soy sauce and (regular?) soy sauce? Also, would Chinese dark soy sauce substitute well for Korean soy sauce? Is Kikkoman soy sauce acceptable for the regular soy sauce? Thanks. jangjorim reminds me of my mom. She'd always make it and bring a batch for me when I was in college. Your recipe for it looks so delicious and clean. Yeah I always hated that it would congeal with fat particles when chilled...gross. But nothing beats jangjorim, rice and kimchi! should be on the post. soy sauce (not the Korean style, gook-ganjang soy sauce). just regular typical soy sauce that most people use, like Kikkoman. Yup, that's how I usually enjoy. So good together. This looks great! 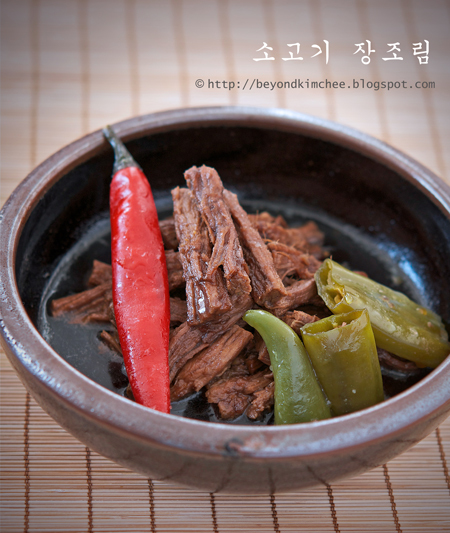 I have never had this side dish, usually I get kimchi or spicy potatos as side dishes when I visit a Korean restaurant. I am sure I will give this recipe a try sooner or later, it looks too good to miss! Thanks for sharing this wonderful recipe :). Beef and spices. This is like the perfect recipe! It is delicious! Thanks for sharing! You're welcome. I am glad you like it. I LOVE your site, and every single recipe here. I am so grateful--there are foods that I have yet to find in cookbooks, that I grew up with. Thank you for sharing! I've been clicking all over your site, and bookmarking so many recipes. Thanks Christina. I am happy that you found many recipes you grow up with. Hope you can try some soon. Is this the same recipe when Koreans also put hard boiled egg along with the beef? My MIL makes something like this but she also puts hard boiled eggs which are delicious. Yes, it is. You can add the hard boiled egg along with the beef. What is the name of the brand for that Korean Rice Wine? This sounds so delicious! Can't wait to try it. Quick question -- We bought half a cow from a local rancher this year. I have several cuts of beef eye round that are 1/2 pound. Do you think I could I use three of them? Would I need to modify the cooking time? Thanks! Eye round is perfect for this particular beef dish. I use it all the time.